Little Gaerfields - with beautiful views in the heart of Herefordshire. The perfect escape! Sleeps up to 25 in 9 bedrooms with 8 bathrooms. Weekends from £2,000 to £2,500, full weeks from £2,200 to £4,800. For shorter stays please enquire. 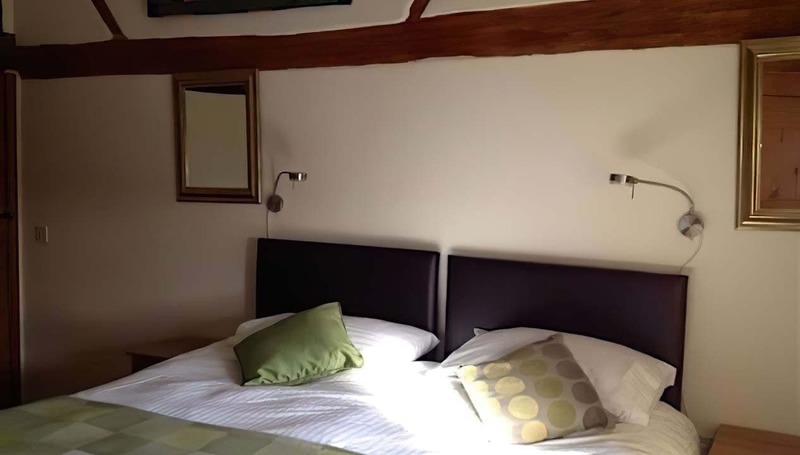 If fully occupied, price per person per night is usually between £13 and £33. 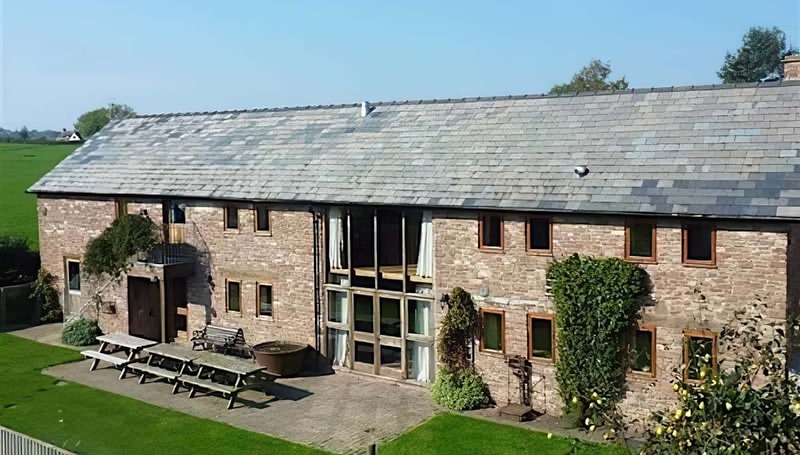 Little Gaerfields is part of a working family farm in south Herefordshire, with far-reaching views across to Wales and The Royal Forest of Dean. The barn was built in the 1600’s from traditional Herefordshire red sandstone, and was once used by Upperfields Farm as hay-store and milking parlour. 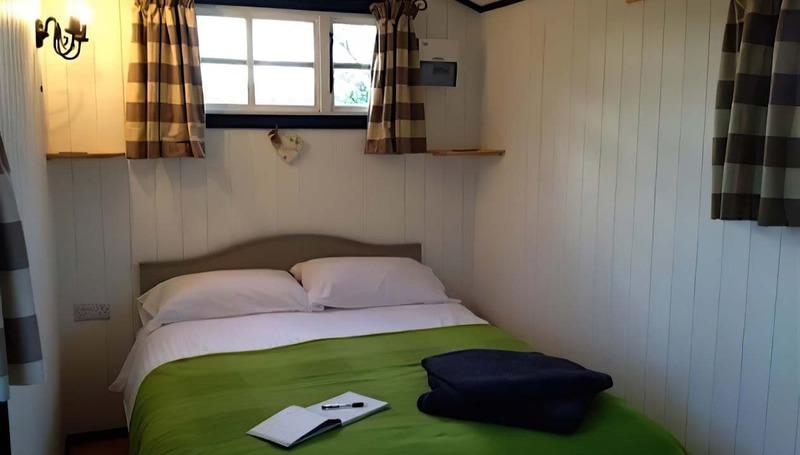 The accommodation at the barn is spacious and flexible, sleeping up to 25 in 9 bedrooms, in various configurations. There is also a shepherd’s hut for hire, should any guests feel the need to really get away from it all. Downstairs, there’s a huge kitchen / dining room with seating for 30 and an inglenook fireplace with wood burner. Peep through the little door in the wall of the fireplace to find the hidden chair; great for party games or for children to run a ‘shop’ from. There are two further lounges with TVs and deep comfortable sofas to snuggle up on. Outside, there is a garden and terrace, perfect for bbq-ing and outdoor dining. In a separate building across the courtyard, there’s an indoor swimming pool, with a jet against which to swim, and a sauna, for easing tired-out muscles. 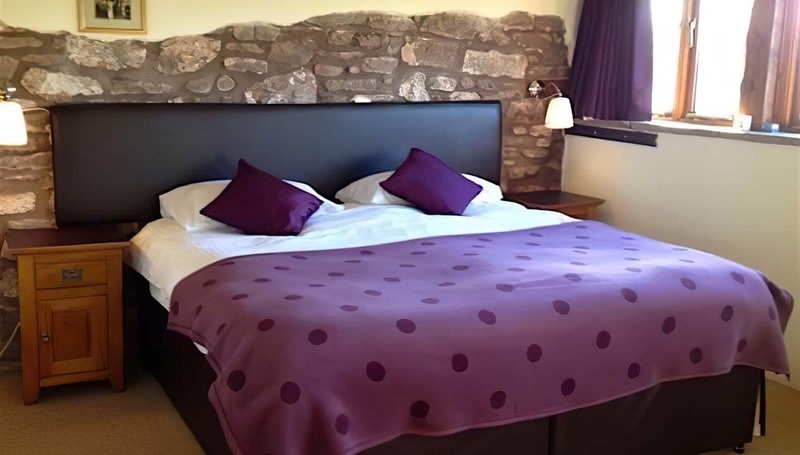 Little Gaerfields is in Llangarron, just outside Ross-on-Wye, on the beautiful Welsh borders. The farm can be reached by the M50. There’s a lot to do in the area; not least Castle-Collecting, with Goodrich, Raglan, White Castle, Grosmont and Skenfrith being less than 20 minutes away.Guided visits toGarway Churchcan be arranged; it is famous for its connections with the Knights Templars, and having one of the best-preserved medieval dovecotes in the UK. Local walks from the barn are lovely, especially the path toTregate bridge, on theRiver Monnow. You can follow the river all the way toThe BellatSkenfrith. 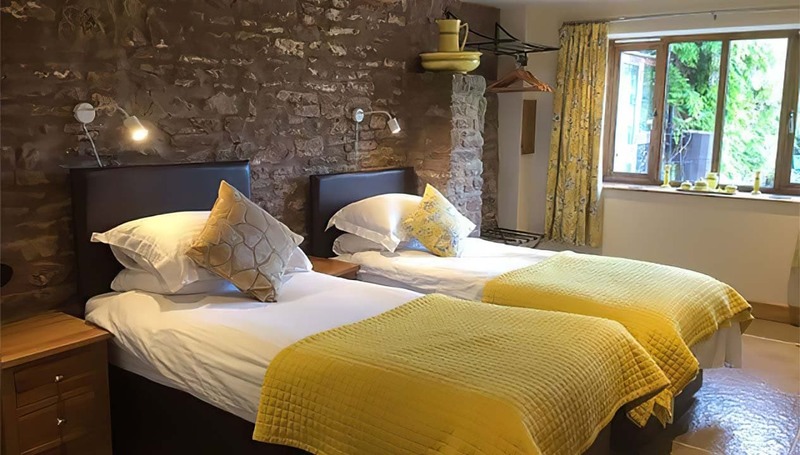 The barn is close to Hay-On-Wye, with its famous Literature Festival, as well as near the Dragon Boat Race and Show ground at Monmouth. If you’re feeling adventurous, there’s no end of extreme or more gentle sports – canoeing, rock-climbing, gorge-walking, abseiling and all that can be offered at Monnow Events. There are two rivers to fish, the Wye and Monnow. A licence is needed from the local fishing tackle shop in Ross-on-Wye. The neighbouring farm, Trippenkennett Farm has two fishing lakes. Several local courses, please ask for details. Just had a really brilliant weekend here celebrating friends’ 50th birthdays. 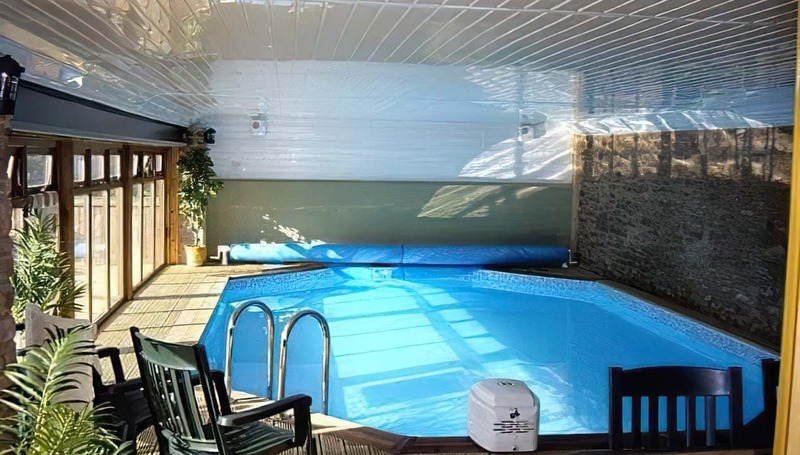 It was perfect for a large group of friends: plenty of space, massive well equipped kitchen, lovely comfortable bedrooms and bathrooms, great to have the pool as well. Would definitely recommend and would love to make a return visit. Great New Years trip! Really loved the homely feel! Everyone loved the pool and amazing kitchen! Bedrooms were lovely and comfy too! Thanks for having us! — with Kerry Wilson and 2 others. Great house, spotlessly clean when we arrived and every room Is lovely decorated! We loved welcoming in the new year here all 30 of us!! All the kids loved the swimming pool and Sheila and family couldn’t of been any nicer and helpful! Thanks so much ! Hopefully be back again soon !! Im just back from my friends hen weekend after staying here and it has been THE best weekend - the house is just beautiful and easily fit all 18 of us. The owner Shelia was very welcoming and ensured we had everything we needed including a homemade lemon cake on arrival :) We used the pool which was lovely, hired a local hall just a short drive from the house for activity arranged by the bridesmaids and even had caterers provide us a 2 course meal on the saturday evening - i understand Shelia was very helpful in recommending local suppliers. Hopefully i get chance to visit again! — with Simi Chana and Abbey Lucy Jones. Just got back from a lovely weekend with 24 girls the rooms were clean spacious. Absolutely beautiful place very relaxing would definitely recommend Sheila ( owner) really nice and approachable and makes a lovely lemon drizzle cake ( welcome gift on arrival) can’t wait to go back. Excellent....beautiful place made some special memories and we were all well looked after. Great place for our family get together. Huge kitchen for communal meals, well equipped and comfortable. The surroundings are beautiful. Really enjoyed our stay. Just got home from a brilliant weekend at Little Gaerfields... the house is absolutely beautiful and the location is idyllic. As a group of 16 we had plenty of space, the beds were extremely comfy and the swimming pool was great fun. Sheila and Vernon are the most friendly, welcoming hosts, we even had a cake and fresh eggs on arrival! We all loved it so much we have decided to make it an annual trip! A wonderful family weekend for my Mum's 70th birthday. The house was fabulous, warm and welcoming, with comfortable bedrooms and clean bathrooms. The kitchen was huge and incredibly well kitted out with all we needed for large family meals. The separate living room with big, comfy sofas allowed the children to play games and watch tv. The swimming pool was an absolute bonus with both children and adults having a great time! All in all, it worked well for our family and we can highly recommend it. Little Gaerfields was the perfect venue for a Hen Do - plenty of space, everything we needed for 20 excited girls, beautiful area, warm pool and wonderful, kind host. We stayed here at weekend for my best friends hen do!! We had a great weekend would highly recommend. We will definitely look at returning in the future thankyou. Thank you Sheila, we had such a wonderful time. Safe to say we'll be back again before the year is out. We stayed here for my sisters hen do and it was perfect. The house is looked after with lots of care and pride and this shows. It's beautiful and in stunning countryside. Sheila was very welcoming and friendly. My family and I, will be coming back. Spent a fantastic weekend here, absolutely wonderful! We immediately felt at home and the house is so comfy with excellent facilities. Had lots of fun doing the team challenge and loved the pool! Highly recommend it & im definitely considering coming back!! thank you! What a beautiful cottage. So comfortable! We found it very hard to leave! Thank you so much for the lovely lemon drizzle cake, what a great welcome! All of the hens want to come back, I have a feeling you will see us again! Thank you for everything! This place is amazing, set in a beautiful location, had everything we needed, homemade cakes, Apple juice and freshly laid eggs left for us, just amazing, the house is stunning, our weather was perfect and the pool was great, seeing some new additions to the farm was lovely too. Thanks for great memories of my hen do Little Gaerfields. Where to start, this place is amazing and just so beautiful, we had the most amazing time here. The pool was great, the views are breathtaking, everything we needed was in the house, the bedrooms, bathrooms and dining table were all so good and there was so much space for all 19 of us, I would recommend this place for any party if you love being in the middle of nowhere, it was just bliss, we also met some of the new animals on the farm, kittens, goslings and chicks, just gorgeous. Thanks for renting your house to us. A fabulous place for a hen party! Sheila was amazing. Highly recommended. The perfect place to spend a weekend with your whole family!We didn't know the area at all and literally stuck a pin in the map to find a place equidistant from Manchester, London and Devon...and we found Little Gaerfields.We couldn't believe our luck : brownies and eggs on arrival, a warm welcome from Sheila, an intriguing house for the children to explore, big bedrooms with lots of sleeping options, a kitchen equipped with everything you need, masses of toys and games..and to top it all a great pool...and a sauna.Easily the best holiday rental we have ever had and we appreciated the care and effort that had been put into it. We stayed for a week as a family of 10 - grandparents, parents and children (aged 2 -11). We found the property easily enough, but as you would expect for the location, the roads were very narrow in places and a little hairy! The children loved the house and all of its hidden secrets - albeit quite dark in places! It was very spacious, and I can easily see the house swallowing many more people easily. Any small problems we had were soon dealt with by the owner. The pool was a great way to spend a rainy day. The children all loved the jets and swimming against the bubbles. It was a good depth for our children, with no deep end. The playbarn was a good space for the children to blow off steam - although it was very, very dusty, and most of the things in it were broken! - With a little love it could be have been fantastic. My son loved the skittle alley and we enjoyed some competitive darts matches. We also had fun playing football in the fields - beware of cowpats (but, again, to be expected). The children enjoyed feeding the chickens and eating the complimentary eggs. Lovely! I would recommend a day to Barry Island. A long trip, but such a beautiful beach. The house was also a good base to visit Ross-on-Wye, Monmouth Cardiff, and the surrounding castles. We also had a family meal in the Royal Arms - A long, leisurely trek across the corn fields if you feel like a walk! The food was okay I guess. My only real negative about the house would be the flies - They were literally dropping like flies everywhere. But as it is a working farm we should have been more prepared for this. So, all in all - lots of space, lots of beautiful countryside, lots of swimming, lots of happy children. Thank you for a great weekend. This place is fantastic! 17 of us spent a lovely weekend at Little Gaerfields a few weekends ago for my sisters hen weekend - I can not recommend it enough! It is set in a stunning secluded location and the facilities are fantastic! Sheila was so accommodating and made us feel at home! Am looking for another excuse to go back! Spent a week here in March for my 30th with 15 people and a few babies. Had a BRILLIANT time....the indoor pool was the highlight of the week with everyone from youngest to oldest. Definitely would go back. We had a great weekend at Little Gaerfields, the house was beautiful and clean. Fantastic facilities including the pool and sauna. Team Challenge around the farm was great fun and we were cooked for on the Saturday evening by Caire and her friend, excellent food and would definitely recommend for party's! We absolutely loved our stay! A whole bunch of us came through from London for a rugby match. Everything was very clean and tidy. Even our groceries were delivered and unpacked by the time we got there. It is a truly beautiful converted old barn and we were sad to go. Exceptional venue for friends to get together. Very comfortable and beautifully set up for families too. So much to do and so little time. We all loved it here. Thank you so much for a wonderful weekend. We had an amazing time and were so impressed with Little Gaerfields, thank you so much again!